11. 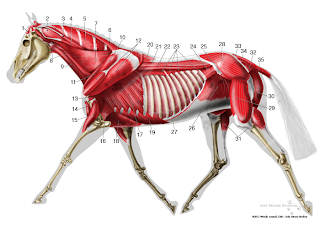 Critique your horse's conformation. Connor almost passed his breeder's ultra-critical conformation eye to become a stallion, but in the end, was gelded. His full brother Cadence did make the cut (That was punny, I'm sorry). I'm grateful, since Connor wouldn't be mine if he were a stallion. There's so much to like on Connor, as there are on all of Lisa's ponies. Nicely sized head (with a somewhat small eye), high-set neck of an appropriate length, wiiiiiiide open shoulder angle (between the scapula and the humerus), a long humerus and also a nice degree of shoulder slope (the degree the scapula lays back, as judged against the 180 degree horizon). Like many Cobs, his back is just a hair long - not something that would matter if he were pulling carts like his breed is meant to do. Despite the long back, his "coupling" (the place where the spine suddenly feels squishy in the loin area) is not too far back, which is a really good thing for a horse doing Dressage and jumping - it's powerful instead of weak. Right below the numbers 24 and 25, at the very top of the back where the red muscle appears to be "pointing" into the white area, that is the coupling. Try and feel it on your horse next time you go to the barn - the bony spine suddenly turns squishy in that area. Connor's hindquarters are a bit steep from the point of the hip down, a nod to being a pulling breed (check out a Clydesdale or a Shire if you want to see a real goose rump!). 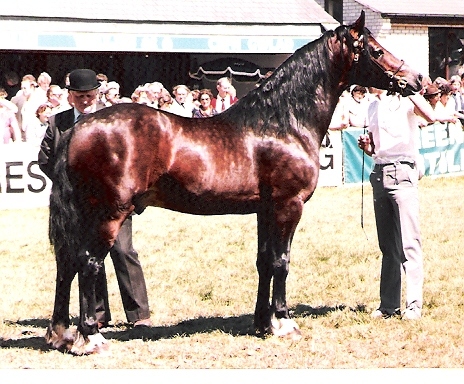 His hind legs have a nice angle and are appropriately set on his body - if you were to draw a line from the point of his rump to his hock to the ground in the photo above, it would be straight. 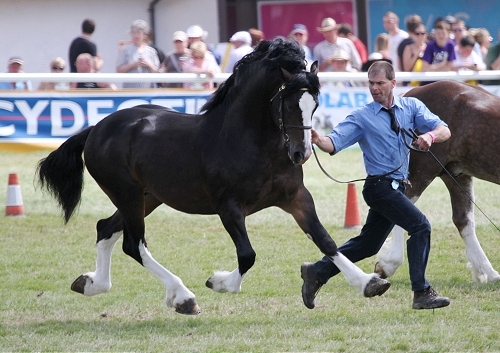 His hindquarter is built to propel him forward in that big Welsh Cob trot. I just realized I missed the front legs. From the side, Connor's front legs are close to ideal. Not behind or over at the knee, cannon bones much shorter than the radius bone, 45 degree pastern angle, generous and well-shaped feet. It's when you stand in front of him that you can fault the front legs: his right leg is turned out at the knee and his cannon bones are slightly offset. When you see an offset leg (and they're terribly common, I don't know if I've ever seen a textbook straight leg) you need to find out where it starts. Is the whole leg offset from the body down, or just from the knee down, or just from the pastern down? All those little bones of the knee, which look like a few rows of cubes stacked next to each other on top of a big column (the cannon bone) need to articulate just so, and any deviation puts stress on parts of the leg that shouldn't have that kind of stress. Connor's whole leg turns out starting with the right knee, and he wings out with the left fore. The right leg situation is actually better than just the knee itself being turned out with the rest of the leg being straight - in Connor's case, those little bones are articulating correctly with the cannon bone, but not with the radius above them. I wouldn't cull for it, in his case, but I am glad I'm aware of it and paying attention to it just in case it needs maintenance down the line since he is in a show home. So there you have it, I've ripped my poor pony to shreds. 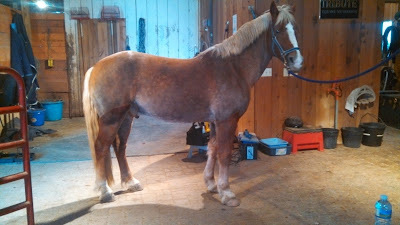 It's a good exercise for any horse owner, in my opinion, so that you know where your possible problem areas lie and can plan for the maintenance necessary to keep him living a happy and productive life. None of them are perfect! I threw a lot of stuff at you without explaining it very well, any questions for this week? 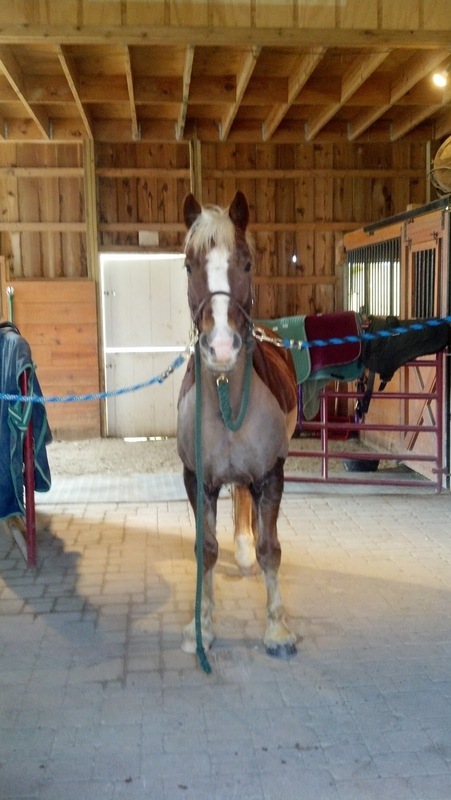 How About We Can Send Pictures Of Our Horses To You And Then You Can Evaluate Them! I don't wanna ;-). Seriously, I try to avoid talking about conformation on horses I know. I have found that most people think they want to hear it, but get defensive and end up not wanting to hear it. Plus I am not even a horse professional, just an armchair conformation enthusiast. I'd consider doing it privately via email if you're REALLY interested. You got it. :-) Seriously though, email me if you are interested, I will totally do it privately if you're serious! What made Connor miss the cut to be a stallion? What it his front legs? No, definitely not the front legs. She's incredibly picky about what of her horses get to go on to become breeding stock (a REALLY GOOD THING that more people should do!). I'm not sure exactly, I'll ask sometime! I do wish people were more particular, too. One thing that is great about the Haflinger Registry is that they have a closed studbook and a very strict rating and registry system. I know Shy would never pass any of their stuff nor be able to be registered, but I am totally fine with that. That's interesting, since Haflingers are becoming so popular these days. I didn't know so many went unregistered. That's good on the breed to regulate it so closely. Hi All, I just saw this tonight. I'll try to answer any and all questions. First, an absolutely perfectly conformed horse does not exist in my eyes, though I have seen some that were very close to my ideal. Connor was gelded because of his head, shoulder and croup. None of these are bad, yet they are not my ideal. I feel a stallion should be VERY tough to fault. As years have passed, I am becoming a little more forgiving of some slight conformational imperfections. Some of the best producers that I have seen were not the prettiest of "ponies", yet they, and those in their pedigrees produced champion after champion. Connor's brother, Cadence is sill a stallion mostly because he is the last and only stud of that line. Connor has full siblings that are National Halter Champions, (Heck, Conner was Reserve Supreme Halter Champion of over 100 ponies when he was only 4-1/2 months old! It was his day. he really showed off) Dressage Pony Cup Champions and there are several half siblings doing CDE's, Eventing (Go Connor) and also being their owner's (both adults and children) best friend and safe companion. I'm realizing the temperament/trainability and willingness of this line NEEDS to be passed on, even if the croup is a little steeper than I like, or the ears are longer than they should be. This line CARES about their rider. Many Cobs do, so they are not very tolerant of abuse. Honest mistakes? Yes, they get that and are very forgiving and will keep trying to figure out what you're asking them to do. If you try to lord it over them, they probably won't tolerate it for long. This post was way to lengthy, which is why I seldom post.